With metallic body accents, leather-trimmed seats and Paldeo wood applique, you could call the 2009 Ford Super Duty Cabela's Edition a fashionable truck — but since it comes with two built-in gun lockers, we won't. Cabela's is the largest outdoorsman outfitter in the world. And by outfitter we don't mean what Tim Gunn does. They sell fishing, hunting and outdoor equipment. Is it time to order some shotgun shells? Need a new fly fishing rod? Suddenly want a portable water filtration device? Cabela's will be happy to hook you up. 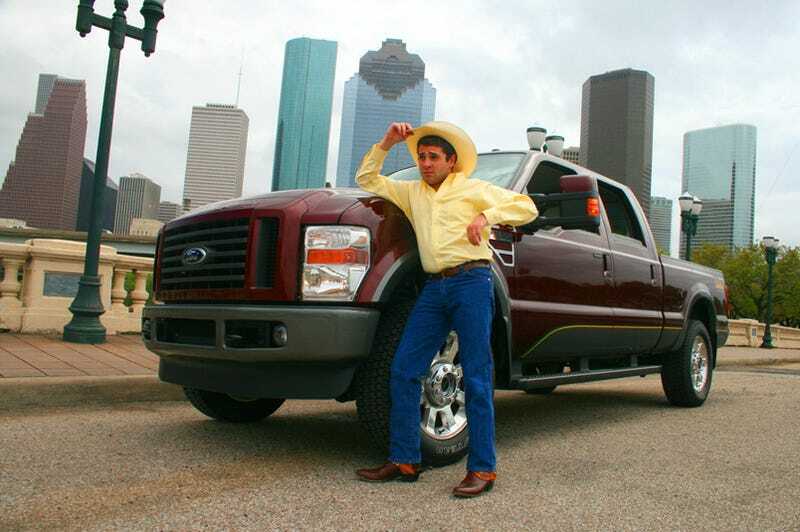 The Ford Super Duty is the gold standard of heavy duty pickups. Both Dodge and Chevy offer Class 2/3 "HD" pickups, but one trip to any livestock show and rodeo parking lot will reveal what people who actually need trucks drive. Combine people who like to hunt/fish and people who like/need big trucks and you've got the most obvious partnership since head shops started selling breath mints. So will this latest flavor of F-series Super Duty reach the target demo? Probably. It's attractive to the average buyer merely on the basis of what this truck, which is based on the FX4 package, is capable of. It manages to be mostly drivable for quick jaunts to the big city while, simultaneously, offering a robust experience anywhere else. For a full review of the capabilities of the platform you can read this review of the Ford F350 Super Duty FX4. Any appeal the Cabela's side of the truck adds to the equation is almost purely sentimental and aesthetic. To put it in the parlance of someone who might buy one: it's all hat and no cattle. For your extra dollar you're going to get an almost garish two-tone paint pattern (our model came in a scintillating magenta Royal Red Metallic) with a green and yellow striping over gray metallic body accents and a large Cabela's logo. On the inside, is your choice of cloth or aniline leather seats with a large Cabela's logo and Paldeo wood appliqué accents. All-weather floor mats with, you guessed it, more logos are also available. The only feature separating the Cabela's from its cousin, the King Ranch edition, is the locking gun storage. Granted, they don't explicitly call it that. It's simply "lockable storage" for your "equipment" and you could, in theory, store a gun-sized metal rod in the large storage locker beneath the rear seat and, I guess, drop some bait in the lockable section beneath the center console. But why? The one up front couldn't more clearly be for your hand gun and the one out back for a rifle — or maybe a dangerous oboe. Does this justify the $2,375 over the already expensive crew cab FX4 with the turbo-diesel V8? Maybe. But the $5,390 luxury package, which adds the leather seats and Ford's SYNC package, is a bit much. What does using a voice command to pull up a Bat For Lashes song or using the nav to find a new Thai restaurant have to do with hunting or fishing? At its face, it seems like little more than a way for Ford to tack on a few dollars to their profit margins. But it's more than that. My friend Marc, pictured, is a well-educated Jewish boy with a law degree living in Houston. He grew up north of where I did in a more rural part of southeast Texas. Neither an avid hunter or fisher, he still has the Stetson, the spurs, the chaps and all the fancy trappings of cowboyhood because, where he comes from, it's valued. People often complain about the numerous special edition trucks automakers roll out but trucks, more than cars, are a volume business with longer platform life spans. Being able to reach truck buyers on a special level gives Ford an advantage, which explains the addition of the Platinum trim to the F-150 this year. One Ford Trucks planner told us, simply, there's no reasonable upper limit to what some truck buyers want in terms of luxuries and amenities. As proof, allow me to present this shiny maroon $60,000 truck.